SEARCHING BROOCH of sponge, blackened steel, stainless steel, aluminum, and concrete, 7.0 x 8.0 x 2.0 centimeters, 2015. Photograph by Checha Sokolovic. The rose-colored slice of cement has the look of a particularly appealing piece of industrial fabrication. Perhaps it is a fixture for a designer kitchen. At 4.5 inches across and about 1/3-inch thick, it is solid and sturdy looking, but also sleek. Slim stainless steel bands encase the outer and inner edges of this pink wheel, and if you pick it up you know exactly what to do with it: slide it over your wrist. The cement, stainless and aluminum bangle Pretty in Pink was made by Checha Sokolovic, a Seattle jewelrymaker with an architect’s eye for bold, unfussy design and a builder’s fondness for industrial materials. Besides cement, Sokolovic works with concrete, commercial quality vinyl, brass washers meant for plumbing, egg cartons, kitchen sponges, and hunks of charcoal and pumice. To make backings and armatures she mostly chooses stainless steel. When she gets fancy, she adds a little sterling silver. 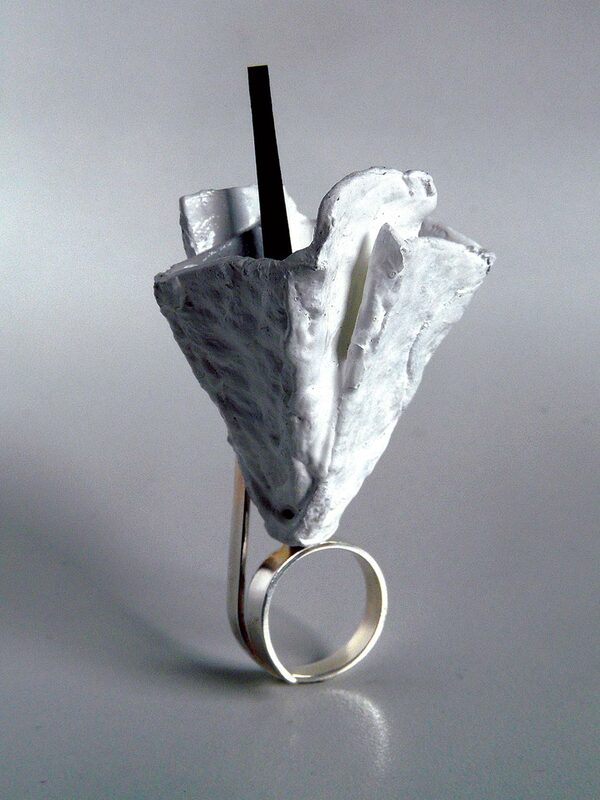 RING OF THE RISING SUN of sterling silver, concrete and PVC, 6.0 x 1.5 x 5.0 centimeters, 2017. Photograph by Barbara Cohen. PRETTY IN PINK BANGLE of stainless steel, aluminum and concrete, 11.4 centimeters diameter, 2012. Photograph by Checha Sokolovic. Creating jewelry out of humble materials is one of the hallmarks of contemporary artist-made jewelry. 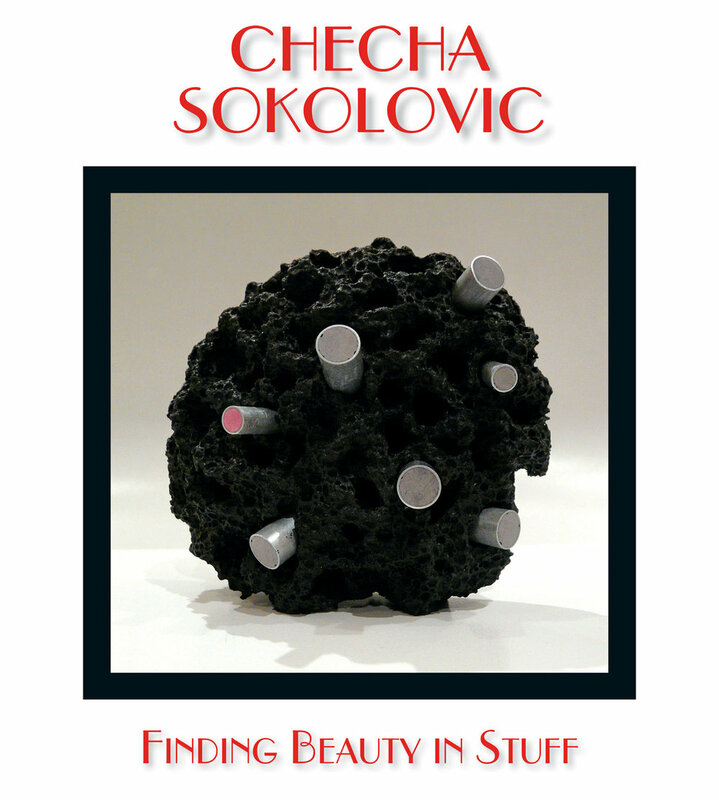 Gold and diamonds are lovely, of course, but beauty can also be coaxed out of far less precious materials—an idea that resonates perfectly with Sokolovic’s modernist aesthetic and her reverence for the common materials of our everyday lives. She whips up batches of concrete and cement in her kitchen, pouring them into molds, sometimes including ice cube trays, and browses hardware stores for small shiny bits that catch her eye, such as washers and screws. The effects she achieves are remarkable. Her neckpiece The Dark Side of the Moon is a four-inch disc of concrete raised in the center and pocked as though pummeled by geological forces. To make the piece, Sokolovic dyed the concrete black, framed it in a stainless steel armature and hung it on black rubber tubing. The Dark Side of the Moon is an evocative bit of cosmic poetry, expressed in the most quotidian of materials. DARK SIDE OF THE MOON NECKPIECE of stainless steel, concrete, dye, and rubber, pendant 10.0 x 4.0 centimeters, rubber cord 107.0 centimeters, 2017. Photograph by Barbara Cohen. CEMENT BEADS NECKLACE of cement, rubber, sterling silver clasp, stainless steel cord, 50 centimeters long, each bead approximately 2.5 centimeters, 2013. Photograph by Barbara Cohen. ICE BEAD GAME NECKLACE of ice, sterling silver, 45 centimeters long, each bead approximately 2.5 centimeters, 2012. Photograph by Sean Airhart. SUN GODDESS NECKPIECE of PVC, stainless steel and sterling silver rivets, 30.0 centimeters diameter, 2018. SUN GODDESS EARRINGS of PVC, stainless steel and sterling silver. 7.5 centimeters diameter, 2018. SUN GODDESS RING of PVC and sterling silver, 5.0 x 3.0 x 0.5 centimeters, 2018. Photographs by Noel O’Connell. Concrete is tougher, and one of her recipes is a mixture of Portland cement and sand. The surfaces of her concrete pieces are rougher since you can see the sand, and the pieces are tougher in that they are less likely to chip. She seals them with a concrete sealant to protect them from water. For The Dark Side of the Moon, she used pre-mixed concrete paste applied over a wire mesh frame. Her love of charcoal, concrete and stainless steel means that much of Sokolovic’s work is a monochromatic landscape of black, nearly neutral shades of dyed cement, and metal. But in the last year Sokolovic has started working with vivid color thanks to her new enthusiasm for candy-colored polyvinyl chloride, or PVC, the material most of us simply call vinyl. “A friend gave me samples of PVC,” Sokolovic says, displaying place-mat-sized sheets of fire engine red and cobalt blue. “And I find mats in kitchen stores made out of it.” Her new Sun Goddess Collection is a dramatic marriage of brilliant yellow vinyl and riveted stainless steel. The collection includes earrings, bracelet, ring, and neckpiece that resemble golden rays fanning out from a blazing sun. Sokolovic says she is a “sun freak,” and that the Sun Goddess jewelry is an antidote to the gray winters of the Pacific Northwest. “As soon as I finish making something I always wear it. I want to see how it feels. With the Sun Goddess Neckpiece you put it on and go outside and you feel warmer.” If there’s a hint of sunshine, the sun refracts off the golden vinyl tossing bits of yellow light around like the darting choreography of fireflies. Sokolovic grew up in Sarajevo, in what was then called Yugoslavia. “I loved growing up there, but Sarajevo really had a small town mentality. If you’re a little bit different, you’re made fun of. So wearing big jewelry in the 1980s was my way to rebel a little. It made me a little different. I didn’t want to blend in.” She bought jewelry whenever she could. As a young woman she spent time on a Greek island that she still thinks of as idyllic. But besides the turquoise waters and sunny climate, one attraction was a small jewelry store where on every vacation she bought something. She talks about a silver bracelet that called to her like a siren’s song. “I had never seen anything like the bracelet. I think it is probably from Asia. I had to have it. It was as much as my rent for the next month, but I bought it and didn’t eat for weeks.” Sokolovic still has the bracelet, which is a simple though elegant silver-hinged bangle with a clasp closure and a little decorative pattern work. Though she never wears it anymore, she says her reaction to the bracelet a couple of decades ago was a telling sign of her lifelong passion for jewelry. In 1990 Sokolovic earned her college degree in architectural engineering and urban planning at the University of Sarajevo. When war broke out a few years later she, her mother and sister fled, eventually settling in Vancouver, Canada, where she picked up whatever work she could find. In 1998 she got a job offer from a Seattle architecture firm and relocated to Seattle. A decade later she was laid off and suddenly had free time. At the urging of a friend who noticed her love of jewelry, she signed up for a class at Pratt. Although she comes from a family of artists, and her sister is a self-supporting artist in Canada, Sokolovic says, “I always thought that I’m not that good with my hands, so it took me a long time to finally try. But when I came to class here I was inspired by the idea that I could make exactly what I want. I express myself through wearing jewelry.” And compared to the precise work she does as an interior designer, her current employment, making jewelry is freedom. 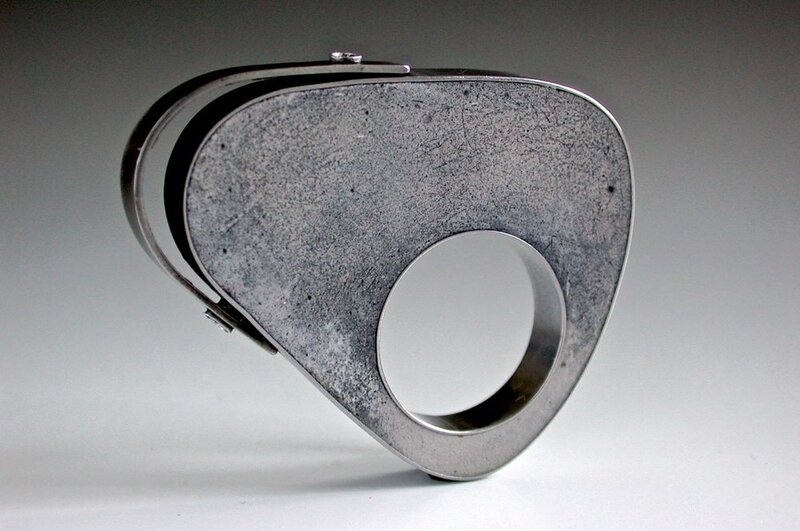 THE ORIGIN RING of stainless steel, blackened steel, cement, 3.5 x 4.5 x 0.7 centimeters, 2013. Photograph by Barbara Cohen. METEORITE LANDING RING of sterling silver, patina, charcoal, cement, dye, and resin, 7.0 x 3.0 x 5.0 centimeters, 2017. Photograph by Barbara Cohen. 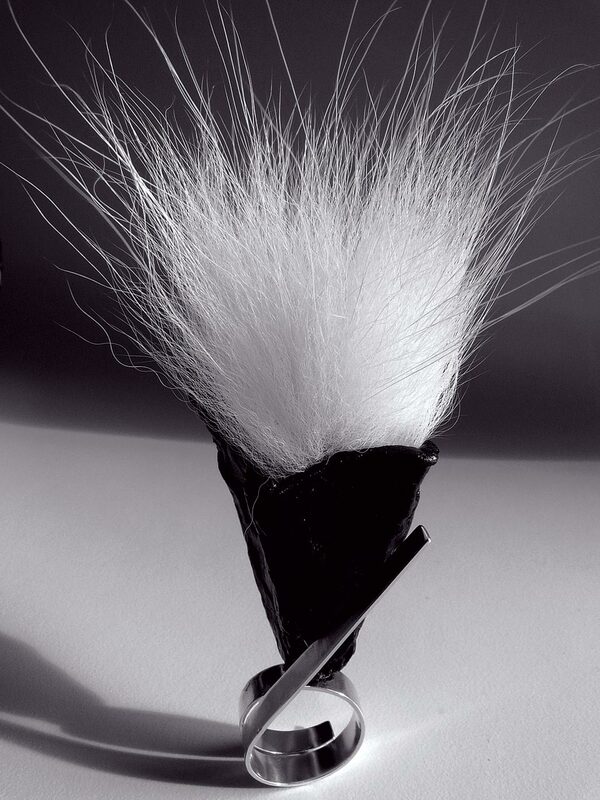 TICKLE ME RING of sterling silver, egg carton, latex paint, fur, 10.0 x 4.0 x 3.5 centimeters, 2015. Photograph by Checha Sokolovic. WINTER BLOOM RING of sterling silver, egg carton, latex paint, rubber,10.0 x 4.0 x 3.5 centimeters, 2015. Photograph by Checha Sokolovic. Partly because of her use of geometric shapes, Sokolovic’s work frequently has a space-age minimalism about it. Her vinyl and stainless jewelry would look terrific with any Star Trek outfit. Her looping earrings and bracelets made of thin-gauge stainless steel ribbon also have a futuristic appeal. Atomic Bracelet is a set of three connected stainless steel orbits pivoting around each other thanks to a rivet at the base of the bracelet. A pair of earrings called Twisted suggests a gravity-defying trajectory through space. Checha Sokolovic wearing her jewelry. Photograph by Krista Welch. PEARLS IN LAVA EARRINGS of sterling silver, stainless steel, concrete, dye, pearls, 1.0 X 7.0 centimeters, 2015. Photograph by Nenad Stevanovic. ZEN GARDEN RING of sterling silver, blackened steel, stainless steel, cement, and floral pin frog magnetic attachment, 4.0 x 4.0 centimeters, 2012. Photograph by Checha Sokolovic. 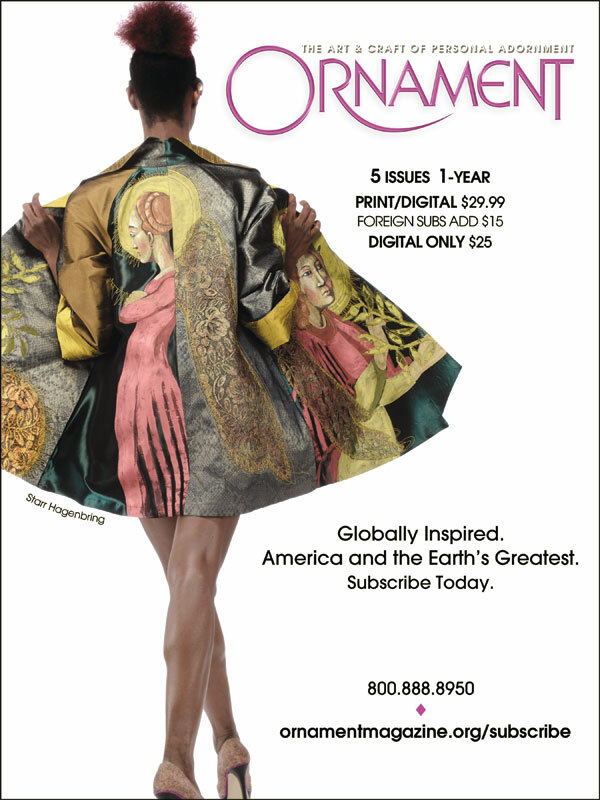 Robin Updike is a Seattle-based arts writer who has followed the Pacific Northwest’s vibrant jewelrymaking scene for nearly thirty years and interviewed many of the region’s jewelry makers. But interviewing Checha Sokolovic for this edition of Ornament was the first time she has met a jewelry artist whose primary materials are cement, concrete and stainless steel. Sokolovic started making jewelry after a couple of decades working in architecture and design, so while her choice of materials may be unorthodox, it makes perfect sense for her. The result is eye-catching jewelry that tweaks our ideas about beauty and preciousness.